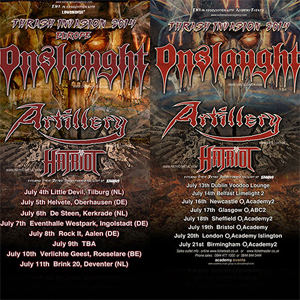 Danish masters of the riff, ARTILLERY, have announced a summer tour in support of UK Thrashers ONSLAUGHT. ARTILLERY's latest offering, Legions, was released on November 26, 2013 on Metal Blade Records and is available now. You can listen to "Chill My Bones (Burn My Flesh)" and watch the video for "Legions" atmetalblade.com/artillery. ARTILLERY had this to say: "ARTILLERY is very anxious to hit the road with ONSLAUGHT and HATRIOT, to support the overwhelming reception of Legions. We can't wait to play some of the new songs together with some of the old classics. Looking forward to meet the best and most dedicated melodic thrashers out there!" ARTILLERY was formed in Copenhagen in 1982, and released their debut album Fear Of Tomorrow in 1985 and the follow-up, Terror Squad, in 1987. Afterwards, the band saw a turbulent time with line-up changes, but by 1990 the band released the much acclaimed By Inheritance record. ARTILLERY released their final effort with singer Flemming Rønsdorf in 1999 called B.A.C.K.